Sensory processing is the mechanism the human brain uses to identify, organise and react to sensory information. This information is collected through the sensory organs, transferred to the brain by the nerves and sent to different areas of the brain which correspond to the required actions. How does Sensory Processing relate to learning new skills and academic progression? Our central nervous system and sensory processing systems form the foundation for all development and future learning. When one of these systems is off balance it impacts higher order processing such as eye-hand coordination or postural adjustment, important for handwriting. When these foundation skills are impacted the ability to regulate behaviour and complete academic learning is also affected. How does Sensory Processing correspond to better performance? Knowing and understanding the effect each aspect of sensory processing has on your ability to concentrate, focus and feel comfortable will allow students to more easily and reliably reach their optimum level of alertness for study/exams. Individuals will have sensory preferences and theses may vary depending on stress levels and the environment they are in. By understanding where a student fits on the continuum of "sensory processing types" will shape the style of instruction, training and pre-exam preparation that will suit their sensory needs. Gieysztor, Choinska & Paprocka-Browicz define primitive reflexes as “automatic movement patterns that commence during pregnancy and are fully present at birth”. These reflexes are utilised to help development of more complex movements for postural control and balance etc. Why do they remain immature? This is an area of ongoing research and there are a multitude of reasons why reflexes remain immature. Some possibilities include trauma during birthing process, lack of tummy time and ongoing ear infections. What is the significance of retaining primitive reflexes? If a child has not appropriately integrated these reflexes, this may present in poor motor skills such as difficulties running, jumping, throwing/catching and sitting still. These factors can result in learning and behavioural challenges in the future, if not appropriately addressed. Fussy Eaters & Problem Feeders? While the terms “fussy eaters” and “problem feeders” are often used interchangeably, they are in fact quite distinct. They vary in relation to factors such as severity of reaction to food, time taken to add new foods to diet etc. For example fussy eaters usually have a restricted diet of 30 foods, while problem feeder have typically 20 foods or less in their died. The SOS approach offers a helpful further insights into this difference here. Difficulties with processing sensory input related to food e.g. smell, texture of food. This means some foods may be rejected even before consumption, due to negative sensory experiences. Fussy eaters and problem feeders are both troubling for a child’s development. In some cases, this may lead to nutritional concerns, due to the limited range of food consumed. It can also be highly distressing and challenging for other family members to deal with, since parents may be constantly battling during meal times. If you have concerns about your child’s eating habits, you may be interested in exploring our “Love Real Food” group. “The only thing more frightening is "thinking" that your child is behind on their milestones and not knowing if they should seek out extra support or wait to see if your child "grows up on their own"
Whilst the ability to roll, babble, crawl, walk and talk are all critical milestones which are easily observed by parents, there are 1000's of mini-milestones that prepare babies, children and teenagers for the next stage of development. These abilities of neuro-developmental maturity form a framework which underpins all age-appropriate skills. Our team of Occupational Therapists have been trained to observe, recognise and value these mini-milestones which sit as foundations for age-related skills and allow the child to streamline their progress from one skill to another as genetics and evolution science record. In some cases, supporting abilities which have not (or cannot) develop is the best approach when learning age appropriate skills, while for other children and adults, it's necessary to revisit these earlier stages of neuro-development to build pathways, strengthen signals from environmental and sensory cues and then directly practice the skills which have not yet been independently mastered. The work of Mary Sheridan, Ajay Sharma, Helen Cockerill and the published resources of the University of Virginia, have influenced the recognition and clinical focus on these mini-milestones during our Occupational Therapy assessment and Achievement Plans. Fear is the main emotion in autism and ...Any little thing that looks out of place, such as a piece of paper blowing in the wind, may cause fear. Objects that make sudden movements are the most fear-provoking. In the wild, sudden movement is feared because predators make sudden movements. We believe that our role when working with families who have a child(s) with Autism that we work towards helping the whole family build skills around understanding and assisting participation in everyday experiences across many areas of daily life. For it is when we have mastered the skill of understanding how to resolve our challenges, we no longer fear. Goals around self-care routines, social gathering, education and learning, fitness and outdoors, sleep, play and relationship with others.are all important when working with families who have a child(s) with Autism. 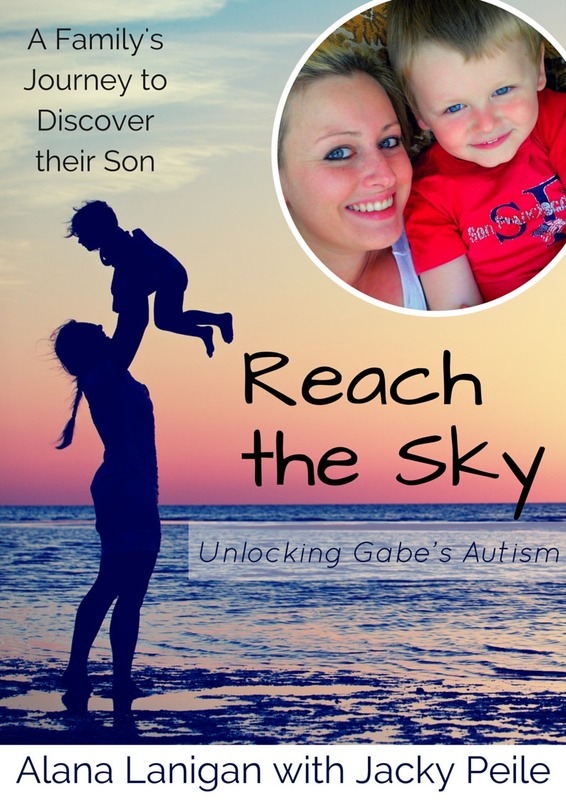 Jacky Peile has also co-authored a book - "Reach the Sky; Unlocking Gabe's Autism" which is available on Amazon.com and details the story of the very first family Jacky worked with on their Autism journey. Alana, Gabe's mother also shares her advice. "Congratulations on publishing the book"